Bridie Lynch, was born to Helen and John Lynch of Maymore, St Johnston, which has been home to Bridie this day. Helen was formerly Sweeney from Creeslough and met John in Scotland and they returned here to raise their family. Helen's father used to walk from Creeslough to Doon Well near Kilmacrennan a popular site of pilgrimage. Bridie is sister to Margaret (Margaret Matthewson, Deceased May 2001), Rosemary (Rosemary Colhoun, Deceased 2008), Grainne and Liam. Bridie went to St Baithin's School, Blueball, and then went to a school for the blind in Dublin which catered for about 150 pupils. Her Dublin geography teacher encouraged her to get involved in sports. Bridie was born with 10% vision in her left eye and 3% in her right. Though visually impaired all her life Bridie says she "never made a big thing of it". She never lets it be a barrier to anything she wishes to do. Bridie went into athletics and was a familiar sight on the local roads where she could be spotted running at any time of day or night. She gave full commitment to her training and was an inspiration to other athletes and she strove to keep her fitness levels to the maximum. Bridie represented Ireland for the first time in Varna, Bulgariam for the European Athletics Championships in 1983. Aged 17, she brought back the discus bronze medal. She went on to represent Ireland in four subsequent Paralympic Games. The first was New York 1984. Then there was Barcelona in 1992 (when she won the discus gold medal). Then she participated in Track and Field events at the 1996 Para Olympic Games in Atlanta where she gained a gold and a bronze medal. Overall, the Irish team came home with ten medals. 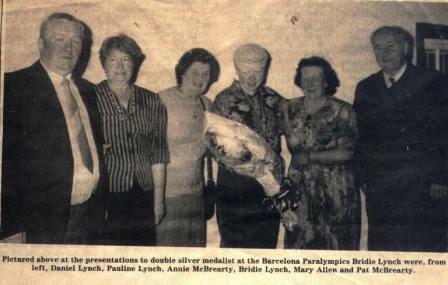 Lastly, Bridie went to participate in the Para Olympics in Sydney in 2000. The plan was for her to participate in the discus throwing event. She was described then as: "Ireland's best hope of a gold medal" and as: "Ranked number one in the world". However she was unable to compete in the pentathlon after a hamstring injury. She had hoped to recover in time but it was not to be. Sadly on October 21st, it was revealed that Bridie had an accident during training when she broke her foot. She was practising for the discus. Bridie was Blindsports World Champion in 1998. In 1999, she won the European Championships. Bridie has been suffering from Crohn's Disease a debilitating condition that affects the joints and the digestive system causing ongoing pain and fatigue. She was hospitalised on a number of occasions and had to be operated on during the summer of 2007. Thankfully her condition improved and Bridie looked to the future. Bridie has now set up her own business in St Johnston at her home. She offers Therapeutic Massage. She travelled to Boston in October 2007 to qualify as a therapist offering treatments in Frequency Specific Microcurrent. She, as we write, is one of only two therapists in Ireland offering this treatment. It is renowned for enabling the body's healing resources to kick in. In 2008, Bridie made some headlines in having lost 4 stone in about three and a half months. She won a makeover package for her amazing commitment to losing weight with the help of Weight Management Clinics. She was on the Late Late Show, Know your Sport and People of the Year. Below, we have newspaper photographs of Bridie Lynch during a presentation made to her in St Johnston to mark the occasion of her having won 2 silver medals at the Para-Olympics in Barcelona in 1992. SHE’D MADE THE walk countless times before. The roadside from Lifford to her home in St Johnston were nothing new to Bridie Lynch one autumn evening in 1992. She got off a bus in Lifford after returning to Donegal from Dublin, but this time was different. Bridie Lynch after being honoured by Paralympics Ireland in 2013. Included on her person were two Paralympic silver medals. To this day, Lynch remains one of Donegal’s finest athletes of all time. Modesty was always a trait associated with her. That evening in 1992 after coming back from Barcelona, she thumbed a lift back to the family home in Maymore, on the outskirts of St Johnston. There was little fanfare. In the weeks previously, she won silver in the B3 discus throw, with gold won by Tamara Sivakova and bronze taken by Ilona Thomas from Germany. Lynch also won silver in the Pentathlon, but the achievement was largely consigned to the sidebars of the local papers of the time. Two Paralympic silver medals became mere footnotes. Four years later, though, she had no need to thumb it home. Having returned from the 1996 Paralympic Games in Atlanta, Georgia, Lynch was greeted by a large crowd at Lifford Bridge and given a heroic cavalcade home to St Johnston, where a reception was held at Maggie’s Tavern. In Atlanta, Lynch won gold in the discus and bronze in the shot. She carried the Irish tricolour at the closing ceremony and led home the team that was met at Dublin Airport by the President, Mary Robinson. She won the discus ahead of Courtney Knight from Canada and Tamara Sivakova Belarus, while she was behind only Sivakova in the shot. “I had the honour of coaching Bridie from 1992 to 2000,” says Eamon Harvey, who was a coach to the Irish athletics team at the 1996 Olympics and stayed on in Atlanta for the Paralympics. Before the Paralympics in 2000 in Syndey, Lynch, who won the European Championships in 1999 – 16 years after first representing Ireland, when she took discus bronze at the 1983 Europeans in Varna, Bulgaria – was described as ‘Ireland’s best hope of a gold medal’ and had been Blind Sports World Champion in 1998. Just two days before the Games began in Sydney, Lynch got injured when a discus rebounded from the cage and broke a bone in her foot. Bridie Lynch still holds the Donegal discus record through her 42.38-metre throw at Santry in 1998.